Jane replied with this fascinating summary from an inspiring waterwoman, “I just love being on the water. And I love racing! Racing forces me to be a better version of myself, not just physically, but mentally. There is something about pushing your body beyond its comfort level that helps you better able to deal with difficult situations in other parts of your life. Racing has a meditative effect. When you are out there for hours, you sort through all kinds of things. Sometimes emotional pain is worse than physical pain so I know if I can go out and be on the water, in any capacity, my worries will sort out. It’s like they say, salt water heals. So paddling has a much deeper meaning for me. Some people that have inspired me would be my friend Nappy Napolean, who still paddles well into his seventies. He just loves to paddle! And he is such a great ambassador for the sport. I think the fountain of youth is to keep moving, and he is a classic example of what you can do. Jane seemed to excel in so many disciplines throughout 2018. I wondered why she loves each of them each and asked for a hierarchy of how each might serve to cross train the over age 50 water athlete. Jane shared this: I had a really good OC1 season this year. I never came in less than third place overall in our winter series, including the M2M, Molokai to Oahu one man relay with partner Alan Goo-Frasier, and Olukai races. I came in 8th out of 24 in the Molo solo and won two M2M races on the one man this summer. I also participate in the Hawaiian Sailing Canoe Racing series with Team Hui Nalu. We sail the entire main Hawaiian Island chain over the course of the summer. I have been canoe sailing for 18 years and it is just amazing. I raced the Napali one man race and the Napali Challenge 6 man race recently. I just completed my first M2O SUP race with team mates Jen Fuller and Kristin Thomas. We had a blast and won our division! I had decided last year to not race with a club anymore for 6 man. I have been paddling 6 man for 26 years and realized that summer offers a whole new world of opportunities for fun racing in all venues that I had been missing out on. It is interesting, that since I have been paddling SUP, my OC1 paddling has improved. SUP provides the strength training and OC1 my cardio and speed, they really compliment each other. I say padding a SUP is like Crossfit on a board! I cannot even contemplate such a full schedule of events – especially across one sweet summer. Jane seems to be hopping from event to event, I asked her to describe her in-between training routine. To what does she attribute your success? This response came easily to Jane: I think my success is attributed to the love of racing and paddling. I love the excitement of racing, getting ready, the nerves at the start line and the knowledge that it ain’t over till it’s over! I won some of my races last year by a hair, literally down to the second, so knowing that will push you to the end. As far as training, I try to split the workouts between SUP and OC1. I find I can only do SUP about 2-3X a week so have to hop on my OC1 to rotate muscle groups so I don’t get over use injuries. I am a huge proponent of massage therapy, I go on an average of once a week. Okay, you made it this far in the article and now comes the “STORY!” Enjoy it! SO! I had been escorting people for the M2O for a few years, Armie Armstrong from NZ, Annabel Anderson, and a Brazilian Prone paddler last year. I have crossed the Kaiwi channel more than 50 times between OC1, 6man and sailing canoe, but never on a SUP. Kristin Thomas and Jen Fuller from California were my Facebook friends and I knew they were good paddlers, so I threw it out to them to do a team together. They were keen, so we were all set to race! We decided to call ourselves Team C&H (California and Hawaii, get it?) They came a few days before the race and we did a few downwinders, and that is all the practice the got before the channel. I was really proud of how they did especially because it turned out to be one of the toughest channels in a decade. A dumping tide made it sticky, crazy disorganized swell, everyone said it was hard. I have a lot of respect for the athletes that do M2O solo. I think the best part of the race was coming away with some wonderful new friends! I had always heard such great things about Jen and Kristin and now I have a whole new group of amazing women athletes as gal pals! We laugh that we will be doing this race together until we are 100. Jane McKee – living her dream in a new decade! No one lives “age is just a number” better than waterwoman, Jane McKee. As I am wrapping up my 7th decade at 69, I look for inspiration and “go-for-it” from people like Jane who live by this truth, “Anything is possible if you believe in yourself.” (from a 2015 Elder SUP article). Now at age 60 Jane keeps doing what she loves – and keeps looking forward for more adventures and goals. Finishing 8th out of 22 women starters was definitely a celebration! I’d like to stay active on the water for another decade or two, so I asked, “What habits (eating training) and lifestyle contribute most to your “go get ’em” attitude at age 60? I definitely find truth in her response about rest. ES: What was your favorite moment of the race (or of preparing for it, a breakthrough or other)? ES: What abilities to read wind, waves, weather contributed to your successful crossing? JM: The solo this year was a tough one. The wind coming so much from the North resulted in a side chop/swell that made it difficult to surf much. The tide was sticky also. I always do my homework before a race so I knew what we were in for. I had to make the best of it. I think if I had taken a more northern course I would have had more of an opportunity to surf down later in the race. After talking to some other paddlers after the race, this seemed to be the strategy. I am fairly good at reading waves but this race didn’t offer up much opportunity for it. ES: What equipment did you use? JM: I have an Ares Pro canoe and use a Makana Alii Paddle. I am thrilled with my Ares. I had great success in last year’s Olukai race when Kai Wa’a lent me one. I was in third place until I snagged a buoy rope the last 20 yards from the finish, which put me in fourth. The conditions that year were tough, we had to race twice around a rectangular course that was mostly side winds. The canoe performed amazingly in those adverse conditions. I know I can surf a canoe but its the off conditions that I need help with and the canoe was a rock star. I walked right up to Tom Bartlett after the race and said ‘I want one!’ I have used a Makana Alii paddle for 16 years and Les Look has always supported me. I love his paddles and appreciate his help all these years. ES: What did you use for hydration/fuel during the event? JM: I did a combination of just water and a Perpetuem mix. I have used Perpetuem for years and it works for me. Unfortunately when I packed I grabbed the wrong lid cover for my camel back so it was basically useless. I had my helper drop small bottles to me which was challenging to say the least. The first year I raced I used Power Bar pieces and Snickers bars as fuel. This year I used Gels and Snickers Bars later so I would have something solid. It worked fine. ES: What was a roadblock or challenge during your prep for this event (or any other in your history) that was tough to overcome and how did you overcome? JM: I really didn’t have any. My training program went well, I had a great race season, I was top three overall in every single race up until Molo Solo, so I was getting results. ES: Any fun or funny story to share- in general – that you just want to share? JM: I remember years ago paddling with some new girls in the six man in a race. We were getting water in the canoe after awhile When the steersman yelled ‘BAIL!” one of them jumped out. I love that story. ES: A “word of advice” or mantra that resonates with you that might inspire others? JM: I think it is really important that you paddle or do whatever sport you do, for the love of it. I cannot imagine not being on the ocean. It is my therapy, love, passion, lifestyle. Don’t let the pressure of racing take your joy away. I see a lot of young ‘sponsored” paddlers that put so much pressure on themselves that it becomes like a job to them. I have been paddling 26 years and I still get nervous before a race. Someone asked me once, after all these years why? I told them, because it means something to me. The day I stop getting excited before a race is the day I quit. We look forward to following Jane’s upcoming adventures on the ocean. Understanding the basic mechanics and physiology of stand up paddling can increase both motivation and effectiveness of our training. 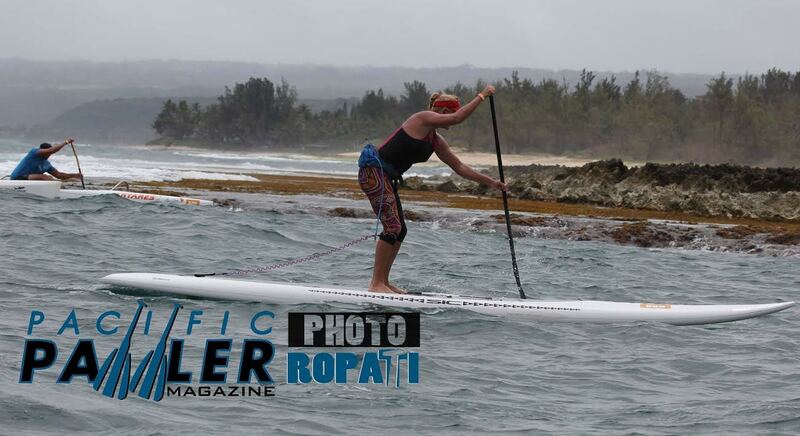 Recent winner of the Kanaka Ikaika Racing Association Women’s Overall SUP Unlimited Hawaii State Championship in April 2015, Jane McKee (profile article here), has taken the time to share some of her solid insights with us. After decades racing OC1 and OC6, Jane began focusing on training for SUP downwind and events in August 2014. Jane provides these tips, “The one thing I noticed immediately after training for SUP is what a huge energy expenditure SUP requires. On my one man I am sitting comfortably on a foam seat, locked into my craft as though I was part of it. On the SUP the only thing locking me onto my board is the bottom of my feet. Every large muscle group comes into play, and in the first month I was completely gassed after about 5 miles. I felt like I was doing squats the whole time, and, well, you pretty much are. Training Nugget:Technique is a big factor in SUP. Leading with the hip, using the big core muscles and leg muscles to balance and drive the board forward, all come into play. I found that the principles of the stroke are pretty much the same in outrigger and SUP. Keep the start of the stroke way up front, and finish the stroke by the feet. Because the SUP paddle is such a long lever, triceps, lats and biceps get a healthy workout. I never weight trained for one man, but find weight training to be beneficial in SUP to keep from getting injured. Also I had to train my legs more. It is very much a leg sport. I did notice that after 2 or three days a week on the SUP and I had to cross train. This is when I would get back on my one man. It is a perfect combination to alternate. The one man gives your body relief from the rigors of the standup while allowing you to train similar muscles and keep your endurance training. And you avoid burnout while still getting to be on the ocean. Training Nugget: Consider weight training, especially the legs and add some cross training to your SUP routine. Everyone has told me I have picked up the sport fast. I have to attribute that to many years of training basically the same muscle groups used in SUP, racing outrigger a LOT. Primarily it is my ability to read the ocean, linking up the waves and finding the path of least resistance. You either have it or you don’t. Some people never get it. It is an absolute must if you want to compete in open-ocean or downwind paddling. When I give OC1 clinics this is a favorite topic. People want to know HOW. I can explain the physics, and dynamics, analyze wave patterns and currents, but you have to get out on the ocean and understand what it is doing that day. You have to really look; pay attention and most of all FEEL the ocean and hear what it is telling you. It is, in my opinion, a gift. Training Nugget: To read waves and succeed in down wind and open ocean events you need to spend time in the ocean and practicing “reading” all aspects of wind, wave and current. It is a life long practice – and a gift. I decided to race SUP this year in the Kanaka Ikaika race series that culminates in the State Championships in April. As I only had my one board, the 17’4 Unlimited, that is the board I raced every race even if it was flat or upwind. People thought I was crazy but I figured if I could push that big board on the flat just think what I could do if it were windy? In the months leading up to the States race I had to really pay attention to not over training by eating well, getting enough rest and learning to say no. Learning to say no if I were tired, even though the conditions were excellent. Your body repairs itself during sleep. Adequate rest is vital to improve your fitness. Thanks so much for taking the time to share this with us. Those few training nuggets could make all the difference this season. Aloha.